Since getPOIs API v6.0, developers can create vision layers which can augment objects in the physical world. For more information on what Layar Vision is, please check out Layar Vision section . In this fourth tutorial, we explain how to create a simple Vision layer step by step. In order to enable Layar Vision, please follow the steps described hereEnable Layar Vision in a layer Please NOTE that only the minimum required code for creating a Vision layer is explained here. A more generic and complete version is provided in the Sample code. Each row of this table represent a Page you have uploaded on the publishing site. Now that we have a ViosionPoi in the database, it is time to build up a web service to fetch the viosionPoi information and return it back to the Layar platform. The returned POI information should be formatted in JSON. If PHP version 5.2 or above is used, JSON is supported natively. Otherwise, the JSON string needs to be constructed programatically. config.inc.php - contains the database configuration information. fourtTutorial_simplified.php - the main php script file which is called by Layar server. It is the same file as defined under "API endpoint URL" field mentioned above. To get started, we pre-define variables for the MySQL database connection and save them in config.inc.php file. We first need to put the LayerName parameter from the GetPOI request in an array. Then, we use $_GET, a php global variable, to retrieve that parameter value. The needed parameter is stored in an associative array named $requestParams, which has parameter name as key and parameter value as value. This is done by calling a custom function getRequestParams(). // Put needed parameter names from GetPOI request in an array called $keys. // Initialize an empty associative array. // parameter name as key. Set up the connection to MySQL database and select the database which contains VisionPOI table. In our tutorial, we use PDO, a PHP extension, to formalise database connection. For more information regarding using PDO, please see http://php.net/manual/en/book.pdo.php. // Connect to predefined MySQl database. Function connnectDb() is defined below. If the database is connected successfully, a database connection handler is returned and assigned to $db. Otherwise, an exception is thrown. Once the database is connected, we can retrieve needed Vision Poi information as well as the respective object and actions of each Page. 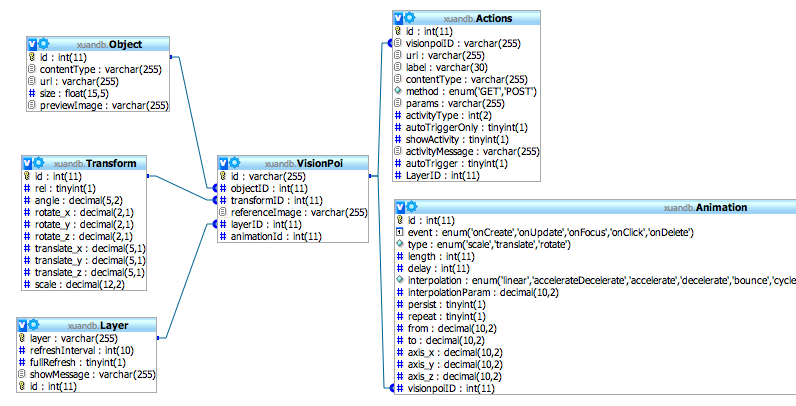 A function called getPoiActions() is created to fetch actions for each Vision POI. We use an SQL statement to retrieve actions that has the same "actionID" defined for the POI in VisionPOI table. Return $actionArray array which contains retrieved action information. //   return an empty array. // Define an empty $actionArray array. // Use PDO::execute() to execute the prepared statement $sql_actions. // Iterator for the $actionArray array. // Fetch all the poi actions. // if $actions array is not empty. // Put each action information into $actionArray array. // Change 'activityType' to Integer. // For vision enabled POIs, we should use "autoTrigger"
// Assign each action to $actionArray array. // Put fetched object parameters for each Vision POI into an associative array. The getObject() function works the same way to retrieve object information. //   associative array or NULL ; An array of received object related parameters for this POI. otherwise, return NULL. // If no object object is found, return NULL. // returns object which has the same id as $objectID stored in this POI. // Use PDO::execute() to execute the prepared statement $sql_object. // Fetch the poi object. // if $rawObject array is not empty. // Change 'size' type to float. //   array ; An array of received POIs. // Define an empty $hotspots array. /* Create the SQL query to retrieve vision POIs. The first 50 returned POIs are selected. // security reasons and will help prevent general SQL injection attacks. // $sql is returned as a PDO statement object. // Use PDO::execute() to execute the prepared statement $sql. // Iterator for the response array. // array indexed by column name. // Put each POI information into $hotspots array. // Put the poi into the $hotspots array. Now we have defined getHotspots function, we can use it to retrieve Vision POI information and construct JSON response. layer: String; The name of the layer. hotspots: Array of POIs; A list of returned POIs information from the database, returned by function getHotspots. errorCode: Integer; 0 is ok. Use any error code between 20 and 29 to return a custom error message that will be displayed to the end-user. // Create an empty array named response. // Assign cooresponding values to mandatory JSON response keys. // Use Gethotspots() function to retrieve POIs with in the search range. // if there is no POI found, return a custom error message. Finally, we are going to write $JsonResponse array into JSON format. // Put the JSON representation of $response into $jsonresponse. // Declare the correct content type in HTTP response header. // Print out Json response. so now you have your first basic Vision layer. In order to test a Vision layer you need to scan the uploaded Page. Make sure to login with developer credentials on your device. Please visit Test a layer to get more information on how to test a layer on the API test page and on the phone. Please find the attached sample code here and start creating your own vision layers!